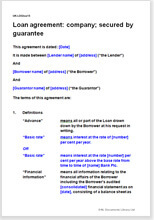 The agreement may be for a loan by a family member to her nephew’s business; by a business angel who has also taken shares; or simply an arm’s length “investment”. Because the borrower is a company, we have included a small raft of warranties. These take effect as promises by the borrower as to aspects of its financial state. We have also provided that the signatory accepts personal liability for his proper authorisation. To some extent that person is bound in the same way as the company. All the better if he is a guarantor. Historically, companies’ legislation required companies to maintain a register of charges. This was replaced with the introduction of the Personal Property Securities Act 1999, although it would be considered good practice for companies to maintain details of security interests they have granted. Security interests over personal property (for example, secured loans, leases or hire purchases) can be registered and searched on the Personal Property Securities Register (PPSR) online at www.ppsr.govt.nz.